Carlos Febles, who managed at Hadlock Field in 2016-17, will be coaching third base at Fenway Park when Boston's playoff run begins Friday. BOSTON — Carlos Febles spent six years as a major league infielder without getting to the postseason. Fifteen years later, he’s finally getting the chance. 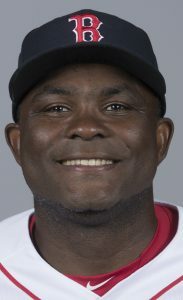 Febles, 42, is in his first year with the coaching staff of the Boston Red Sox, a team that just completed a 108-win season and starts the playoffs on Friday at Fenway Park. The past two years he was manager of the Double-A Portland Sea Dogs. “Being my first time in the big leagues as a coach, and being on a team like this, you can’t ask for more,” said Febles, Boston’s third-base coach. Well, Febles could get greedy and ask for a little more, like a deep October run and a World Series title. He would become the second former Sea Dogs manager to coach on a Red Sox title team – Arnie Beyeler was Boston’s first-base coach in 2013. Febles, 42, played six seasons for Kansas City from 1998-2003. The Royals never finished higher than third place in the AL Central. Febles signed with Boston in 2004 as a minor league free agent. He played 68 games for Triple-A Pawtucket, but shoulder and knee injuries shortened his season, and he soon retired. The Red Sox stayed in touch with Febles, who resides in the Dominican Republic. He helped with Red Sox minor leaguers in the Dominican, and then became a minor league coach in 2007. His first managing gig came in 2011 with short-season Lowell, then two seasons apiece in Greenville, Salem and Portland. When Boston hired Alex Cora to replace John Farrell as manager this year, almost the entire coaching staff was replaced. Third-base coach (and Mainer) Brian Butterfield left for the Cubs. Cora hired Febles for the job. Febles is the third Sea Dogs manager to reach Boston as a coach, after Beyeler and Ron Johnson (2010-2011). Both Beyeler and Johnson were first-base coaches. Febles jumped into the hot seat at third – where every decision is analyzed. But we have not heard much about Febles in the third-base box. “When you don’t hear your name, it’s a good thing,” he said. Part of the reason is that Febles operates cautiously. Why not? Boston led the majors with 876 runs scored. “With an offense like this, it’s a lot easier,” Febles said. “Sometimes you’re swinging the bat well, you go base-by-base and don’t take too many chances. One of those aggressive times came on April 24 in Toronto. Brock Holt singled to left and Febles sent Eduardo Nunez home from second base, with the potential go-ahead run in the ninth. Left fielder Curtis Granderson threw Nunez out by almost 10 feet. Toronto won in the 10th inning. Febles said the reason to send Nunez was simple. Scouting reports favored challenging Granderson – and Boston had been slumping, coming off two straight losses in Oakland, one of them a no-hitter. Boston was criticized early for baserunning blunders, but that was mostly on the players’ poor decisions, not the coaches. With 108 wins, the baserunning did not cost too many games. Febles is enjoying the ride. One player Febles watches is third baseman Rafael Devers, who Febles mentored last year in Portland. Devers jumped into the majors last year, hitting .284/.819 OPS, with 10 home runs in 58 games. This year: .240/.731, 21 home runs in 121 games. His defense is hot and cold. Devers is one of many former Sea Dogs on this roster. Most have been in the playoffs before. But not Febles. He played on losing Kansas City teams, and then endured the minor league coaching grind. It has been a spectacular debut season, one he hopes to end by pouring champagne in late October.